Previous address shown as Winston Co., AL and wife as Elizabeth Sharpton. Daniel Sharpton born around 1824 in Edgefield County, South Carolina. He would marry Georgia-born Elizabeth R. Wages in Gwinnett County, Georgia and they would eventually have eight children. Daniel volunteered for service on March 28, 1864 in Decatur, Alabama. He was 40 years old at the time and was living at Houston in Winston County, Alabama. 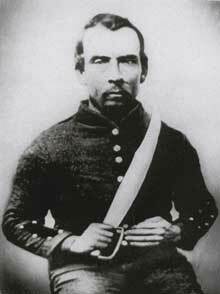 He mustered in the service as a Private on April 13, 1864 at Decatur, Alabama in the First Alabama, Company G. He volunteered to serve for three years or duration of the war. His two oldest sons, William Alan and Joel T. Sharpton, volunteered the same time Daniel did. Daniel Sharpton died in U.S. Army General Hospital at Nashville, Tennessee on Sept. 9, 1864 by reason of chronic diarrhea.